This month, Frank’s continuing quest to build a late AMC 500 single moves onto the clutch. Is he a real man, clutching at straws, or is there a complicated joke about straw men in here somewhere? Some restoration projects should carry a health / wealth warning, as Stuart Urquhart discovered the hard way. His Mk2 Interstate is finally finished. So what’s it like to ride? And was it worth all the effort and the not inconsiderable cost? PLUS! 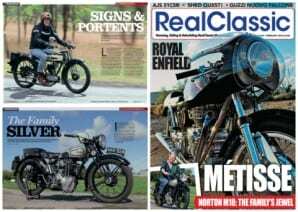 Graham Ham’s ShedQuest visits a veritable wizard in the workshop, the proud owner of some stunning vintage V-twins; PUB tries to hibernate but doesn’t quite succeed; Dave Minton remembers riding a motorcycle through a tree trunk; and RC readers rattle on about the Triumph Phoenix prototype, big end bolt stretch, Commando clutches, Wulf engines, stippling techniques and a clattery Ducati. Plus there’s news, events info, small ads and more. Next Post:Let the world see your classic at our show!